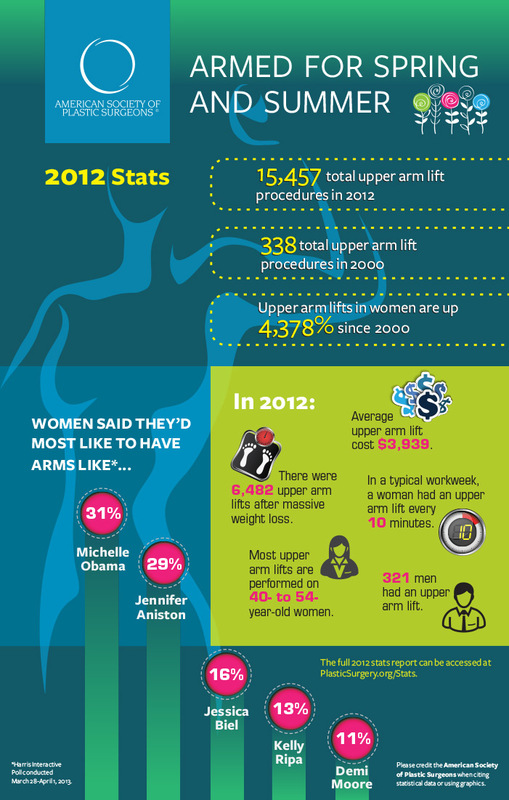 ARLINGTON HEIGHTS, Ill., April 29, 2013 – New statistics released by the American Society of Plastic Surgeons (ASPS) show that arm lifts in women have skyrocketed a staggering 4,378 percent in just over the last decade. It is a trend fueled, in part, by sleeveless fashions for women and more focus on strong-armed celebrities. 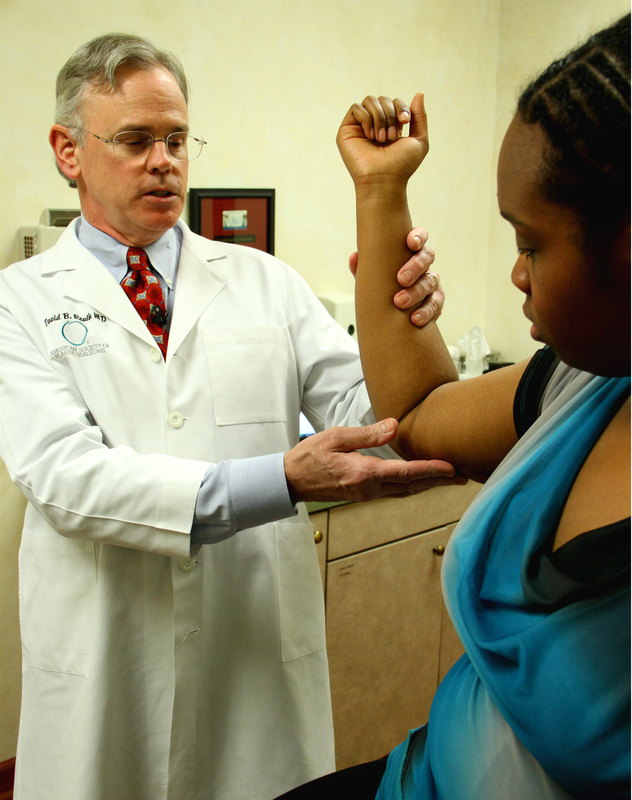 In 2000, more than 300 women got upper arm lift procedures. Last year, more than 15,000 did. Upper arm lifts can include liposuction or a surgical procedure known as brachioplasty, in which loose skin is removed from the back of the arms. Doctors say there is no single reason behind the increase, though celebrities from the White House to the red carpet may be having an influence. A recent poll* conducted on behalf of ASPS found that women are paying closer attention to the arms of female celebrities. According to the poll, women most admire the arms of first lady Michelle Obama, followed closely by Jennifer Aniston. Actresses Jessica Biel and Demi Moore, and daytime TV talk show host Kelly Ripa also got votes for their toned arms. That was three years ago. Today, Robinson has lost more than 170 pounds and continues an amazing transformation through diet and exercise. But for all the weight she’d lost, Robinson says she still wasn’t entirely happy. A brachioplasty requires an incision from the elbow to the armpit, generally on the back of the arm, leaving a visible and permanent scar. 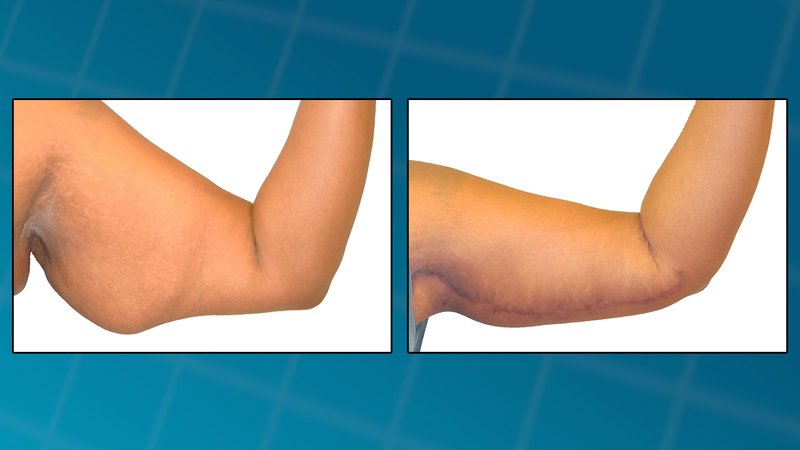 For Robinson, the scar was much easier to deal with than the excessive skin, but Dr. Reath cautions patients to carefully consider the pros and cons before having an upper arm lift, particularly a brachioplasty. Dr. Reath stresses the importance of proper diet and exercise as part of a healthy lifestyle to all his patients, but says some women simply can’t achieve the look they want on their own. Many who simply want to tighten and tone their upper arms, but don’t have a lot of excess skin, opt for liposuction instead of a brachioplasty. For more statistics released today on trends in plastic surgery including gender, age, regional, national average fees and other breakouts, refer to the ASPS 2012 National Clearinghouse of Plastic Surgery Procedural Statistics report at http://www.plasticsurgery.org/news-and-resources/2012-plastic-surgery-statistics.html. (Stats on this site will be updated with the specific demographics and trends when embargo lifts on 4/29/13). Information about procedures and referrals to ASPS Member Surgeons can be found at www.PlasticSurgery.org. * This poll was conducted online within the United States by Harris Interactive on behalf of the American Society of Plastic Surgeons from March 28-April 1, 2013 among 1,219 women ages 18 and older. This online poll is not based on a probability sample and therefore no estimate of theoretical sampling error can be calculated. For complete poll methodology, including weighting variables, please contact Shannon McCormick. About ASPS: The American Society of Plastic Surgeons (ASPS) is the world’s largest organization of board-certified plastic surgeons. Representing more than 7,000 Member Surgeons, the Society is recognized as a leading authority and information source on aesthetic and reconstructive plastic surgery. ASPS comprises more than 94 percent of all board-certified plastic surgeons in the United States. Founded in 1931, the Society represents physicians certified by The American Board of Plastic Surgery or The Royal College of Physicians and Surgeons of Canada. ASPS advances quality care to plastic surgery patients by encouraging high standards of training, ethics, physician practice and research in plastic surgery. You can learn more and visit the American Society of Plastic Surgeons at PlasticSurgery.org or Facebook.com/PlasticSurgeryASPS and Twitter.com/ASPS_News. (from left) Dr. David Reath examines Natalie Robinson's scar post surgery. According to new statistics from the American Society of Plastic Surgeons, more women are undergoing brachioplasty to get rid of excess skin from their upper arms. The before and after photo of Natalie Robinson's upper arm lift, performed by American Society of Plastic Surgeons member, Dr. David Reath. 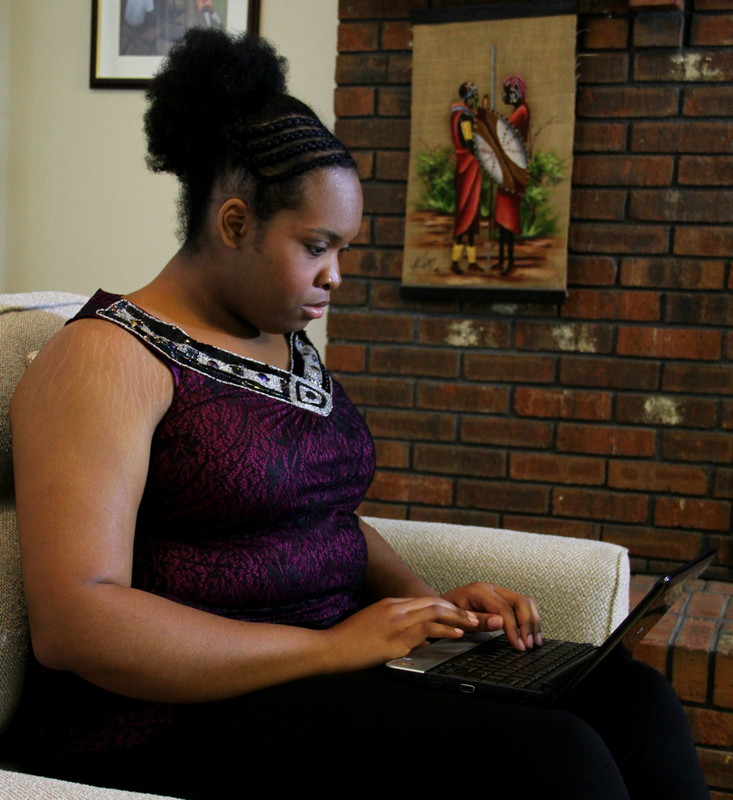 The excess skin is a result of a hefty weight loss that she struggled with. Natalie Robinson is now more comfortable in a sleeveless blouse after her upper arm lift. The American Society of Plastic Surgeons believe in part could be credited to popular sleeveless fashion. (from left) American Society of Plastic Surgeons member Dr. David Reath snaps photographs of Natalie Robinson's arm after her upper arm lift surgery. Natalie chose to undergo the procedure to tone her arms after her 170 pound weight loss. 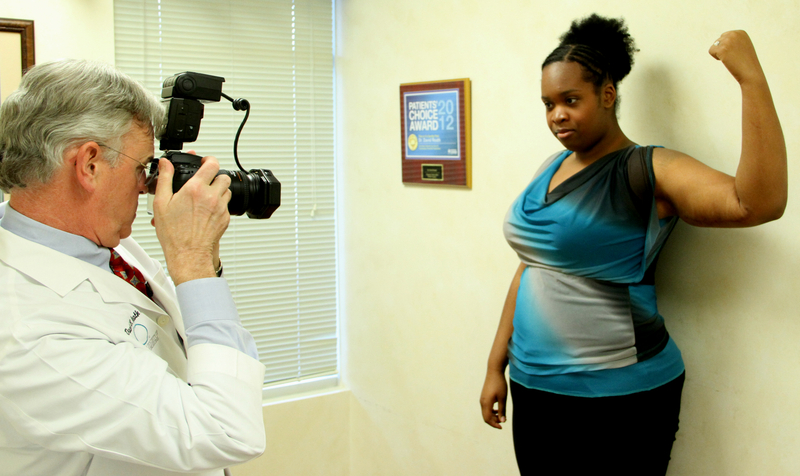 (From left) Dr. David Reath examines patient Natalie Robinson's arms in her follow up appointment after her upper arm lift procedure. 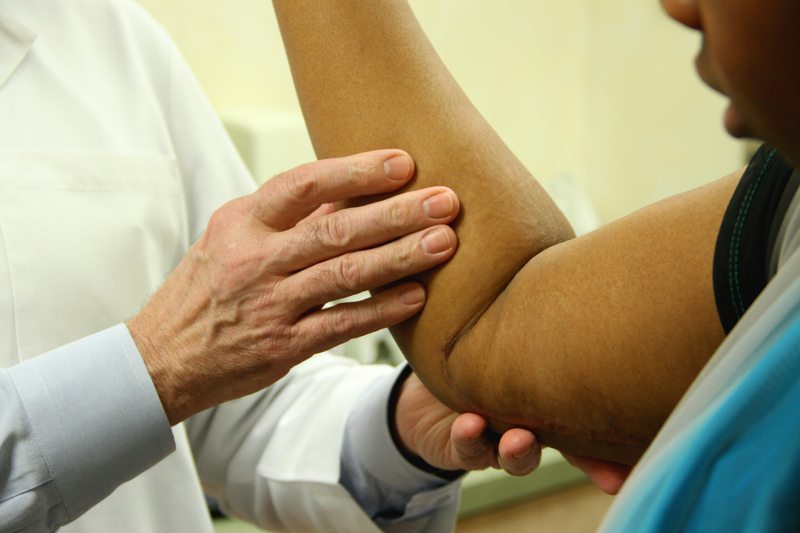 New statistics from the American Society of Plastic Surgeons show upper arm lifts have jumped 4,378% since 2000.